Southbound Interstate 5 will be closed from the I-805 merge to La Jolla Village Drive on Thursday night into Friday morning, transportation officials announced Wednesday. The closure begins at 9:30 p.m. Thursday and ends at 5 a.m. the following morning. Traffic will be diverted from the 5 Freeway onto I-805 as crews work on the temporary support structures on the Gilman Drive bridge project. Motorists should expect delays, the San Diego Association of Governments said. The agency urged drivers to seek alternate routes to avoid congestion. 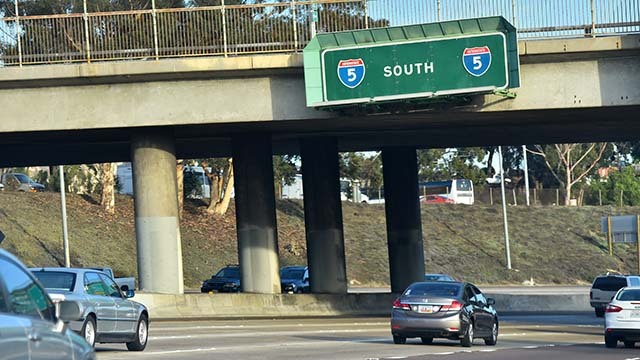 SANDAG is constructing the Gilman Drive bridge over I-5 to offer a new connection across the freeway on the UC San Diego campus.